My friend grabbed my arm and yanked me up to stand beside her, on top of the folding chairs. “What if we fall?” I shouted in her ear. But I was drowned out by the high-pitched screams from all directions. It was 1984, I was thirteen, and this was my first concert. The energy and excitement, borderline hysteria, was enough to burst my teeny-bopper brain into a million pieces. Music was emanating from the giant speakers, but the band had yet to take the stage. It seemed like every girl born between 1968 and 1972, within a thirty mile radius of Dallas, was under the roof of Reunion Arena that night. All of us screaming, some crying, releasing the pent up energy that we’d been harboring since we first received the envelope in the mail from Ticketmaster. As the band took the stage, I felt as if I might be able to fly. I propped open the lid of my laptop to catch up on the day’s events and return some work emails, and of course, ended up on Facebook. Scrolling through my news feed consisting of political diatribes, pictures of cute kids, and shared news stories about Shaun White, something unusual caught my eye. A ticket stub from thirty years ago, this very night. My friend had posted it with a shout out to the girls with whom she attended the concert, one she met that night for the first time and is still friends with today. Women from the far-reaching corners of Facebook were commenting on her post, sharing, and reminiscing about that staggering night. Everyone had a story about the concert, and what the band meant to them. Thinking back, there was plenty of shared eagerness to go around, but not everyone got it. I recall boys in my eighth grade class teasing me about my enthusiasm for the band. 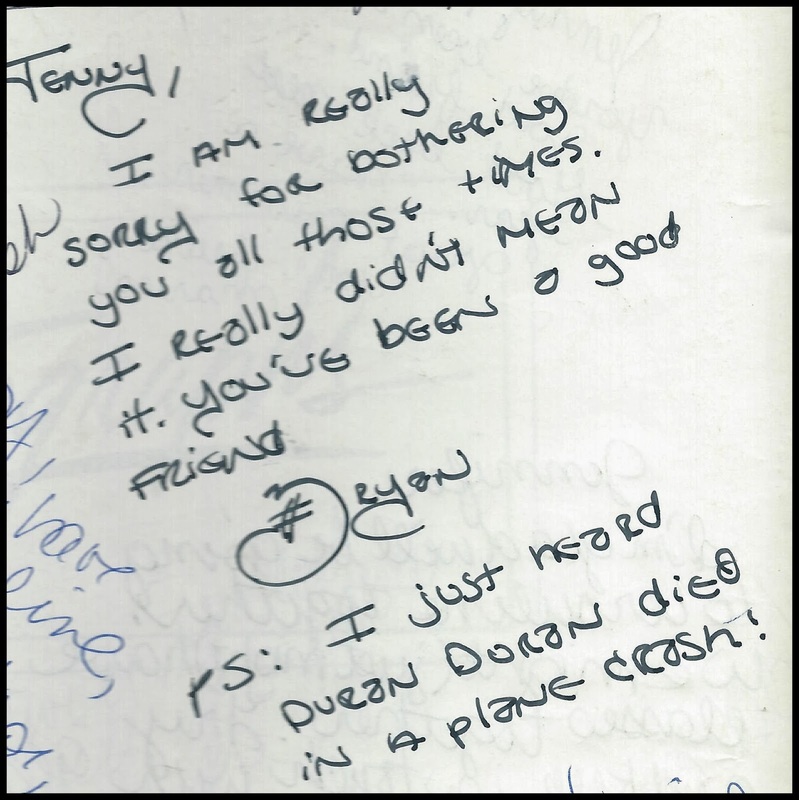 Ninety percent of the friends who signed my yearbook in 1984 mentioned my “Durannie-ness” in their notes. 8th grade yearbook note from one of my sweet tormentors. The reason why we went (and still do) go crazy for this band is not just the music, their astonishing good looks, or their glamorous personas. The core of why we remain dedicated to this group is how it brought us together. In bedrooms with gingham-checked bedspreads and canopies, we swapped more than vinyl. We shared our secrets, struggles, and fears. According to the highs and lows that only a teenage girl can conjure, we went from dancing around the room, laughing and singing, to crying over the things that troubled us. Divorce. Distant fathers. How much we hated our hair, our complexions, and our thighs. Whether a boy would ever like us. Whether we would ever like ourselves. It was more than fluff. Duran Duran’s music allowed us to slip into a pain-free world where we could be that beautiful woman on the boat or the mountain top, commanding attention and full of confidence. Many a vulnerable moment was shared between me and my friends, wedged in with outbursts of sheer teen silliness, and the sum of those parts is something that will be remembered for a lifetime. It made us belong somewhere and be part of something bigger than ourselves. And as long as John Taylor is still walking this earth, I’m not ready to give that up. You be sure and hold onto that ticket stub and post it again in another 10 years, Ms. Krista!! The gingham bedspread and canopy bed line jolted me awake...that reminder of who so many of us have been, and that 80's music we grew up by! That note his hilarious! and you are adorable with your love for all things duran duran. I always wonder what happened to the boy who wrote that note. He probably married a girl who loves Duran Duran. I was 14 for the Seven and the Ragged Tiger Tour. SO GOOD! My first concert also. At the time I adored Roger, then moved on to Simon. Have you heard their cover of "Come Up and See Me"? Live, really fantastic. But I'll still always love Planet Earth best. Oh maybe not…Maybe "New Moon on Monday"? Or just everything. Ahhhh! Now I need to go listen to a bunch of Duran Duran's old songs. Oh man, Duran Duran. Takes me back – way back. :) Although for me, it probably would've been more Nirvana during my early teen years. Oh, Nirvana, you're making me feel old! I was already wasting my days inside a cubicle at that point. Omg I hate to tell you my first teenage concert was creedence clearwater revival... I know most of you don't remember them, just think - they did I heard it through the grape vine somewhere between motown and the calif. raisins... it was a rocking good time in the Oakland Colliseum... thanks for the great memories! I do remember CCR...there is nothing like a first concert, if you're a music lover! Loved this! Who knew a post about Duran Duran could be so deep and touching? I loved this line: In bedrooms with gingham-checked bedspreads and canopies, we swapped more than vinyl. Makes me reminisce of my own adolescent moments with dear friends. Thank you! So glad you liked it. Thank you for reading. This made me remember all of my pre-teen moments with my friends, gathered in someone's bedroom with the door closed, gossiping and laughing and talking serious talk. Thanks for the memories. I'm a little older, and I was one of those who teased a younger co-worker who was obsessed with them. I liked thinking about them from your perspective. Yes, there was lots of teasing going on, but all in good fun! Love that you fought through a blizzard to see them. A kindred spirit! And John is just as cute as he can be! I can't tell you how many slumber parties revolved around fake weddings between my friends and various members of Duran Duran. There was also the love for George Michael, but sadly, that was a love doomed from the start.